A trip to Canadian cottage country reveals epic views and a fish population to challenge any angler. Located two hours north of Toronto, Ontario, the Muskoka region is “cottage country” at its finest. The area’s three main lakes — Lake Rosseau, Lake Joseph and Lake Muskoka — are surrounded by palatial cottages and their charming boathouses, many owned by professional hockey players, Canadian captains of industry and the Hollywood elite. With its collection of pristine, secluded islands and miles of glacial shoreline, Muskoka is a well-known family destination that attracts thousands of visitors each year. The scenery is breathtaking; a canopy of hemlock, pine and maple trees provides the perfect green backdrop to set everything else into stark relief. For boaters, access is easy thanks to dozens of free public launch ramps in the area. And while it’s rarely considered a fishing haven, for those in the know, the fishing in Muskoka can be phenomenal. The three lakes’ sheltered bays are filled with structured drop-offs that hold a variety of fish, including largemouth bass, smallmouth bass, walleye, pike, lake trout and muskie — a personal favorite. Serious muskie anglers tend to fish for these feisty creatures by fast-trolling plugs alongside open-water rock structures or in the weed beds lining the shore. In general, these anglers have two speeds for retrieving a bait: fast, and really fast. I like to give the lure a little time to show itself near the surface before I plunge it back to its depths. 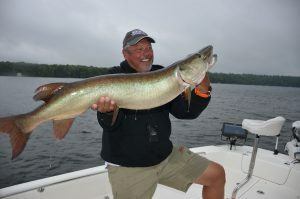 In my experience, that drives muskie mad! As far as lures I concerned, I recommend using either jerk baits or inline bucktail spinners. These help you get the big fish to chase your presentation all the way to the boat. With an aggressive figure-eight routine, you will hook up at least 50 percent of these follows. The beautiful thing about jerk baits is the way they rise to the surface and then, with a long draw, dive back under before returning to the surface again. In the fall months, the muskie are feeding aggressively and they’ll just explode on your bait — it’s really exciting to see. And don’t be surprised if you hook a 5-pound-plus bass using this technique. No matter what type of Boston Whaler you own, the endless cruising and fishing opportunities make it well worth a trip to the Muskokas. My 240 Dauntless, with its comfortable open layout and handy trolling motor, is perfect for getting in the shallows to ﬁsh and explore every cranny of these incredible shorelines. Whether you want to fish, dine at any number of restaurants overlooking the water, or kick back and admire the glorious sunsets, this region is a boater’s dream for all ages and tastes. 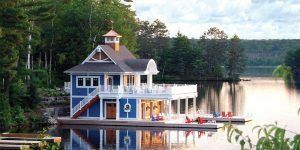 Plan on staying a few nights at one of the many classic Muskoka resort properties: From Taboo Golf Resort to the Windermere House to the magnificent summer retreats and turn-of-the-century boathouses, there’s no shortage of great places to stay. And stargazing here isn’t limited to stellar sights that light up the summer sky. On any given day, you may bump into celebrities who own homes on the water, such as Kurt Russell, Goldie Hawn, Martin Short… or me, ﬁshing aboard my Dauntless and dreaming of owning a home there myself! National Geographic recently named Muskoka the number-one place in the world to live during the summer. Once on the water, you’ll know why. The pros at PENN® have released a new Conflict II reel designed to elevate your fishing game.